“Mama, may I have a popsicle for breakfast, please?” Normally, the answer to that would be no, of course. During her second full summer in the world, nothing brought Lucy more delight than popsicles. 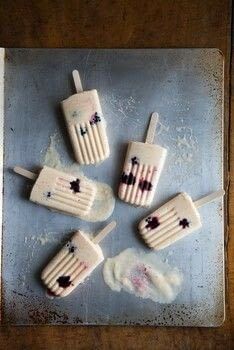 We started making pure fruit juice popsicles, which are wonderful. However, they contained too much sugar for me to feel comfortable giving them to her for breakfast. These came to the rescue. Yogurt, honey, and blackberries? That sounds like a fine, frozen breakfast to me. It’s a lovely dessert at the end of a long, hot day as well. Posted by Wiley • Published 14th July 2013 • See Wiley's 3 projects » © 2019 Shauna James Ahern / Other · Reproduced with permission. Making the popsicles. Add the yogurt, 1 cup of the blackberries, the honey, and basil, if you are using it, to a blender. Blend until everything has turned purple and has a smooth texture. Filling the popsicle molds. Plop a whole blackberry into a popsicle mold. Pour a bit of the yogurt mixture into the mold. Plop in another blackberry and more of the mixture. Repeat until the mold is three-fourths full. Repeat with the remaining popsicle molds until they are filled. Freeze until the popsicles are frozen through, about 1 hour.